All transactions are safe and secure with a reliable history in online purchasing behind each of our associates. 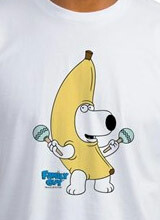 Buy the Peanut Butter Jelly Time t-shirt to own Family Guy clothing and merchandise. Family Guy Peanut Butter Jelly Time is based on a popular Flash animation that became an internet phenomenon in the early 2000s. The animation features a dancing banana set to music by the Buckwheat Boyz. On an episode of the Family Guy cartoon, the talking dog Brian dresses up as the banana and dances to try to cheer up Peter Griffin. He sings the song, "It's Peanut Butter Jelly Time." In addition to the Peanut Butter Jelly Time tee above, browse the Family Guy Clothing Gallery for more apparel like men's and women's clothes, kids shirts or hoodies.